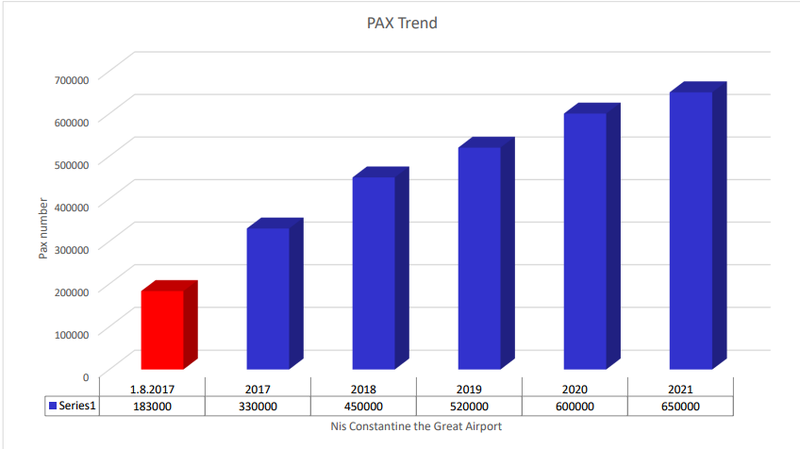 Niš Constantine the Great Airport, in Serbia's Southeast, anticipates handling a record 330.000 passengers by the end of the year with figures expected to almost double by 2021. This year has already become its busiest, with just over 200.000 travellers welcomed through its doors so far, up from the 124.917 passengers handled for the whole of 2016. At a press conference yesterday, the Serbian Regional Development Agency South said strong passenger growth is projected over the following four years, with up to 650.000 travellers expected in 2021. During the first half of the year, Constantine the Great Airport was the second fastest growing in Europe among those welcoming less than five million passengers per year, up 366.3% on the same period in 2016. The airport, which had almost no commercial flights just two years ago, is now served by Wizz Air, Ryanair, Germania Flug and Swiss International Air Lines on a year-round basis after lowering its fees to three euros for handling, landing and passenger services. On October 31, Ryanair will introduce its fifth service to Serbia's second largest city, from Stockholm Skavsta, while Swiss has announced plans to boost its operations. Lufthansa Group's Regional Manager for the former Yugoslav markets, Berhard Wodl, said at a press conference on Thursday, "This year we opened up a new destination, which is Niš, through our group member Swiss. We are currently serving Niš twice per week and we will continue flying there during the winter time. As of next summer, we will even increase it to three weekly services". Niš also sees potential in the launch of new routes, primarily Paris Beauvais, Oslo, Geneva, Frankfurt Hahn, Istanbul and Moscow. The Development Agency noted that other destinations with less but sufficient demand from Niš include London, Brussels and the Stuttgart area, while Tivat, Malta and either Athens or Thessaloniki could be operated seasonally. In addition to passenger flights, Niš Airport is also served by scheduled Turkish Airlines Cargo services. Niš Airport is attracting a growing number of travellers from nearby areas. Currently, Kosovan residents hold the second largest passenger share at Niš Airport, just behind those living in either Niš or Southern Serbia. Kosovans account for 13.6% of all travellers. They are followed by those from either Belgrade or the northern province of Vojvodina (7.1%), then Eastern Serbia (11%) and Western Serbia (6.1%). Those residing in Macedonia account for 5.2% of all passengers, followed by travellers from Bulgaria, holding a share of 1.5%. Based on Ryanair's customer profile, the majority of passengers to and from Niš are young workers living abroad, followed by student backpackers, romantic breakers and business travellers. 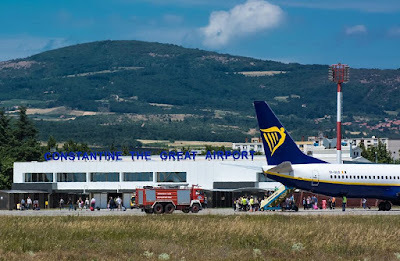 The majority of Ryanair's passengers on its operations from the Southeast Serbian city are Serbian nationals, followed by German, Slovak, Italian and Dutch citizens. In order to cater for the significant growth in passenger numbers, Niš Airport recently overhauled its terminal building by expanding check-in and boarding areas, as well as building a new exterior and undertaking roof work. The Serbia and Montenegro Air Traffic Services Agency (SMATSA) will finalise the installation of an instrument landing system (ILS) at the airport this year, which provides guidance to aircraft approaching and landing on a runway during low ceilings or reduced visibility due to fog, rain or snow. Valued at 100.000 euros, the system will be put into operation next year. Other planned investments include the installation of approach lights in 2019, as well as a 3.5 million euro expansion of the terminal building, which is set to begin next year and completed in 2019. That same year, SMATSA will begin construction of a new air traffic control tower and contingency centre valued at ten million euros. It is due to be completed in 2020 and put into use in 2021. Interesting stats, especially about the number of passengers from Kosovo. Great news, especially since they adjusted their projections for 2017 from 320.000 to 330.000. I always said that INI's greatest advantage is the fact that it's cheap. Their scheme is great and I am sure once they pass 500.000 passengers per year they could slowly become self-sustaining. From the looks of it, that could happen in two years. LX's success is extremely important as it will send a signal that there is a market for Eurowings. I could see them launching VIE, DUS or STR. Now, if only LX could adjust its schedule so that they can offer decent connections to North America. A final point, it's interesting that 13% came from Kosovo and Metohija. What would be interesting to know is if these passengers used SKP or PRN in the past. No Nemjee, you always said that the market simply isn't there, except LCC. LX is demonstrating that the market is there. JU did nothing to help develop the market and it should be reminded of this every day. Yes and some months ago I said I was proven wrong by LX. I still firmly believe that JU has no business in INI unless it plans on launching flights from Belgrade. Operating from focus cities is hard. Even Aegean is more or less shutting down their mini hub in LCA. You know what they say: one swallow doesn't make a summer. Since you so firmly believe that there is a market for legacies, who according to you should come next? Lot? Air France? SAS? United? One of the serious business mistakes JU made over the last four years was ignoring the potential of INI. Company could easily have additional 200K pax at INI this year. But the arrogant stile of JU leadership simply left that market segment to the others. JU can hardly match FR's and W6's fares out of INI so their success down there would be questionable. Just because there is a market doesn't mean everyone can make the most of it. Air Serbia has enough to deal with at BEG. They don't need more of that in INI. That said, what JU could have done is to have used Aviolet for some charter flights out of INI during the summer season. The question is: what should be the primary purpose for the existence of a national carrier? Development of air traffic, naturally. For JU it's profitability, according to the public statements of its officials, and Nemjee's comment above. But, it should be kept in mind that JU got 41 million euro as a little help from the taxpayers last year. With the fraction of that amount channeled into INI operations, JU could be competent at South Serbian market. I think Serbian is the key word here - Serbian company, Serbian market, Serbian national carrier. We lost clear vision of being National at the expense of false "profitability". Yeah but national aviation interests can only be promoted if you have a strong and stable national carrier which we don't. Maybe one day when JU stabilizes and becomes profitable they could look at the country's secondary airports. At this point they can barely meet the demands at BEG. O cemu pricas? Ne mogu da postignu na BEG, a imaju tri aviona viska i 40 meleona jura dotacija? Опет, питање је колико би ова линија била рентабилна имајући у виду куповну моћ на југу и број нискобуџетних авио-компанија које лете из Ниша. А што се тиче тих милиона, они их нису добили како би их нагомилавали на рачуну већ како би покривали текуће трошкове и остали у бизнису. Мање више исти принцип по ком је аеродром у Нишу преживљавао преко 30 година. Што се Ниша тиче, обе наведене ставке у вашем коментару су без основе када се сагледа целокупна ситуација. Наравно, Ер Србија би могла да лети Београд-Беч-Ниш-Беч-Београд али онда би се ред летења пореметио и ЈУ не би могла да нуди преседања из Аустрије даље ка Балкану и Блиском истоку. It's incorrect to claim that JU is not a stable national carrier. Stability to the company is provided by regular state subsidies, not only during the last four years of ASL, but during JAT period as well. That's how the company reached its 90th birthday - on state subsidies. In the second comment, you are discussing profitability ("rentabilnost") and business model of ASL. Subsidized economy is not based on profitability. It's goal driven. That means the business model is adjusted to the goals agreed. In case of JU, The National Carrier, one of the primary goals should be development of National Air Transport. With such goal it makes sense to be subsidized. Take the case of EY, National Carrier of UAE, heavily subsidized by the government, with clear mandate to draw as much pax to AUH as possible. Case of JU: it's subsidized, but no clear goal to fulfill the national interest of developing air transport. Instead, the "business model" roams between "regional airline model", "boutique model", "hybrid model", and who knows what will be the next invention of airline's muddleheaded leadership. In the meantime, Serbian taxpayers are here, will not go anywhere, and will continue to subsidize the stability of The National Carrier. The problem is not on the state providing stability, but at the airline. It has incompetent leaders with no vision, who simply handed over the INI market to other companies, without even trying to take piece of that pie. I can't say I agree with you. Regular state aid to Air Serbia is not a sign of stability but of life support. If the government stops giving JU the money it needs, it won't become unstable, it will collapse. Subsidized economy simply does not work, no matter what your goal is. If this was untrue then Communist regimes around the world would not have all collapsed. What's the cost of EY? Should Serbia follow that model or should it look at Greece or Latvia which have stable national airlines which actually contribute to the national budget. Every country needs an aviation strategy, no doubt about that. However, tying it to one airline is unwise. I believe competition is the healthiest thing there is in business. It forces companies to remain vigilant and competitive. I still don't understand why people are obsessing about JU not having flights out of INI. That airport was saved. They finally became realistic about who and what they are. They no longer have illusions which is why they are no longer running after Air Serbia. I think the government was right to invest in Air Serbia back in 2013. They needed a fresh cash injection to reinvent themselves and to modernize their business model. However, these handouts should stop at some point. Every business is there to be successful and profitable so that it can pay taxes which are used to run the country. Why should the private sector be disadvantaged? Air Serbia is not private sector. It is a national carrier, majority owner is the government (read: taxpayers). Yes, every business is there to be successful, but the question is how long it takes to become successful. In case of Airbus it took over 25 years to reach break-even. Until than they were developing on heavy government subsidies, which provided them with stability over almost three decades. Air transport is core part of one country's infrastructure, directly facilitating the development of the economy. Namjee, you can't be serious if you are claiming that just market economy will develop INI, or any other new air-traffic market. It won't. At least not in a short period. Every economist knows that. Government's task is to develop new and improve existing infrastructure in every country. For that reason it's completely insane that JU is not present at INI. Namjee, it is very disappointing that your comments are supportive of the incompetent management of Air Serbia. They managed to ruin the company in a very short period - in only two and a half years after a great start with the new brand. Because they didn't have in focus that Air Serbia is The National Carrier, not just another private company. It is not a question of disadvantaging private sector. Do you believe that Lufthansa would care about national interest of an underdeveloped country such is Serbia, or it would use the market for its own benefit? Another example: Kondic was against flights to NYC. But it was a strategic and important decision pushed through by the government. Real effects of the line will be seen maybe in 5-6 years. Do you think that Lufthansa, or anyone else dominant in market economy driven sky over Serbia, would bother to think about Serbian long-term interest? Air Serbia should be present at every active airport in Serbia, in this case INI, and subsidized for that presence if necessary. Do you think it's normal that Air Serbia doesn't have rep office in Nis anymore? Just because of market economy driven factors? Well, if 15 percent of Air Serbia's revenue is state cash poured in (read: taxpayers gift), you can't claim market economy rules. Additional two-three million expense at INI wouldn't change much, but could help JU to generate more growth, be present at South of Serbia, and many more indirect benefits, including developing relations with Kosovo residents (second largest group at INI) that will be the first to fly from Pristina once the line is established. Why did you get the impression I was supportive of Air Serbia's management? All I said was that every business must be profitably run and that there has to be a return on investment, regardless if you are a private investor or a government. Pouring billions into a state project never helped anyone. What happens if one day a local businessman wants to set up his own airline? Does the government refuse him the permit just because we have a government funded airline? Why should Air Serbia be considered a company of national importance but not some large private company that's actually managing to compete efficiently and to survive without government handouts? I have noticed that lately a number of reports appear in domestic media stating that Air Serbia has received 40 mil € of state aid last year. I failed to find any reliable source of where that money actually came from? How it failed to be noticed by careful eyes of Ryanair lawyers? Svi znaju da AS nije dobila ni dinara osim onoga šta je država dužna da uplati za benificije od 51% kao vlasnik. Ali pošto je kurir napisao 40 miliona mislim da je to lepša cifra za hejtere pa neka to ponavljaju kao papagaji. You are supportive of Air Serbia management, and I found that wrong. And yes, Air Serbia is a company of national importance because there is no other Serbian airline. If one day "a local businessman set up his own airline" it might become company of national interest. Until then Air Serbia will keep that position. It's not about a particular company, but about development of air traffic in Serbia as core infrastructure. For that we need national airline, but properly managed. Unfortunately Air Serbia is today improperly managed by incompetent people. "Air Serbia is a company of national importance because there is no other Serbian airline. If one day "a local businessman set up his own airline" it might become company of national interest"
Centavia was setup by a "local businessman" who had no clue (and still has no clue) about aviation management and aviation in general. No thanks, Air Serbia will be that airline of national importance in Serbia. Merkel went to Abu Dhabi recently to effectively dismantle Air Berlin. Not because Germany is not large enough market for two national airlines, but because they wanted to reduce any risk for LH from LCCs etc. Lufthansa is a choosen one in Germany, Air Serbia in Serbia. Check out JU's financial reports. Ako je drzava potpisala blanko ček da izdrzava JU 4-5 godina onda je to valjda OK prema nekima na forumu. JU's financial reports show ~ eur 164m in direct subsidies. Add BEG fees write-off and discounted jet fuel and you get the better picture. Don't discredit the claim just because it was published in Kurir. I do not discredit a claim a priori, I was just wondering how come 40 mil € appeared out of blue. Kakav konstruktivan komentar Nenade. Bas je doprineo diskusiji, svaka cast. This could be a good model for airports like Osijek, Banja Luka, Maribor. OSI seems to be struggling with attracting airlines and passengers. Maribor could work. Like it says NYO-INI from Oct 31. Yeah but nothing besides that. So basically next year BEG and INI combined will handle between 6.3 and 6.5 million passengers. Morava Airport could do just as well. Hope thet finally open it. Serbia is really market to LCC trafic. Just landing at BEG last weekend. Again, Serbia will raising LCC trafic to over one million passengers on not too distant future. At least on BEG, INI and future runing Kraljevo's Morava Airport. After seventy seventh landing from Australia at BEG airport, Europe is not paralel space to me. And Serbia is not far away land. To me so far. Good luck Anon 8; 44 PM. Still plenty space on this blog to all of as. Serbia is land of opportunity for comercial aviation. LCC trafic including. And raising as well. Till next Easter, al the best. Good to see ILS will finally be completed this year. ILS installation is required before any airline commits to basing an aircraft there. Maintenance center and catering is required before any airline commits to basing an aircraft there. ILS would be desired, but not required. Catering is not really a large issue, since they don’t offer any fresh food or meals on board. Also there is no need to have “maintenance centre”, a licensed enginer with a toolbox is all you need for a daily check. And even without that, most airplanes can have 48 hours between checks, which means you can swap them with a different base every other day. Not optimal, but possible. Still some way to go but it's on the right track. I like the look of the terminal after reconstruction. Much better than the awful brown color. Agree. But it looks a bit sterile now. Hopefully when they do the extension it should come together. The terminal looks so much better now. I wonder what all those people who said that there is no potential for INI, have to say now. There were experts saying many times that it's only potentially for LCCs. Now we have Swiss flying too. So, it would be good for those to come out and admit that they were off. There is one legacy airline. If it was a super magnet for legacies Lufthansa and Austrian Airlines would be looking at it, not Eurowings. Ok, now the answer is " it's only one legacy airline" :-). Could someone explain why the Air Passenger Fee on the tickets with Swiss and Germania appears as ~CHF 15, but everyone says it's eur 3 at INI. Is this some other tax/fee ? I think it's one of the government taxes, not the airport one. That is the Serbian passenger service charge which is a state tax required of any airline flying to any of Serbia's airports. What kind of service do passengers get for these 15 CHF? It's a regular tax that all countries impose and goes to the Civil Aviation Authority. Transit passengers do not pay this tax. It goes to the development of air safety, technology etc. As to where the tax goes, it's anyone's guess. Transit passengers and JU's model are being subsidised by other passengers. What a master spin Anon 2:17. I'm surprised you haven't mentioned how hospitals in Serbia are dilapidated because the state is subisiding JU instead. It probably goes to subsidising the bloated public service or those other well run mega loss makers such as Srbijagas and Galenika - take your pick, there's a heap. The govt gets a pretty good ROI on its investment in JU - look at the value of the airport, the catalytic impact that it has had on tourism and the entire supply chain that lives off JU. I wonder if anyone has actually tried to calculate that ? ~4 million P2P passengers ÷ 2 x eur 16 = eur 32 million. I wonder how the money is spent on air safety . I am sure Wizz Air and Ryanair helped Serbian tourism way more than ASL did especially since they tend to be cheaper. Also, I highly doubt the government earns more from JU than what it invests. Far from it. Ryanair doesn't even fly to Belgrade. Wizz and Ryan destinations are not based on inbound tourist demand to Nis but on diaspora locations and demand. There is no sub-category as diaspora, just the visitors. They may not spend as much as Chinese tourist, but every little counts. I forgot, BEG is the only tourist destination. Where did I say that Belgrade was the only tourist destination? You want to correct yourself or ask admin to delete your post? If you don't want your words misinterpreted then please explain what you meant by saying " Ryanair doesn't even fly to Belgrade" in this particular context. BTW, anything on my statement "Diaspora = Tourists" that I need to clarify? What does BEG charge airlines other than JU for landing, ground handling and passenger service ? First sentence at 3:29 is an obvious idiocy, I made a mistake for trying to get you back to your senses. Enjoy the world in which less than 100k Ryan "tourists" to INI contribute more to Serbian tourism than JU. Must be nice in your W6/FR bubble. Same for diaspora = tourists nonsense. Fundamentals of marketing call for knowing your customers and segmenting the market. Airlines know it very well, but you just pi**ed on all that. Ignorance is bliss, enjoy it! We need people like you as a sanity check for the rest of us. Wow... as you accused me of misinterpreting your words, i will repost my comment "if they come more often that they used to these airlines do contribute to increase in tourism". Where did you find JU in here ? Now, let me lower myself to your level. You must be a JU fanboy (or a bot) seeing JU everywhere around you, as if you are in JU bubble. Btw, I'm not Anon @3:29. Well discussion was around comment at 3:29. To avoid confusion, use nick like "Cro fanboy from QC" or something. Things are looking up for Nis. I'm loving that smaller cities like Nis get an opportunity to grow and get good connections. Nevertheless, I have to say that airport procedures and organization have to change if they want new passengers to get a good impression about the airport itself. I'll keep on using Nis airport and I hope them to grow, but they have to improve! Yes, I guess time and some procedures will solve it! I didn't want to critize, just to describe the situation I saw. Hope they get more connections for the next seasons! it charges everyone the same, based on the services they use.... they also have a volume and new route incentive for all airlines... it's on their website. Thanks, i was looking at the price list. I also see the Passenger Service Charge of EUR 16.5 and Security Charge on BEG airport website, which is confusing as some stated earlier today that this was a government tax. Can anyone shed some light ? Where does this money end up, on BEG's top line or is it being passed through to CAA ? What Cat. of ILS are they installing? Kinda important this. How about financial statements. Oddly last one was published in 2015.